NOVEMBER 2018 THE SHOP 45 Hood-Mount Off-Road Jack Holder Rugged Ridge, Suwanee, Georgia, a Truck Hero Inc. company, presents its new line of Hood- Mounted Off-Road Jack Holders for 1997-2006 Jeep Wrangler TJ/ LJ models. Designed with simplicity and practicality in mind, the jack holder brackets attach securely to the hood hinges of the Jeep, allowing for unrestricted jack retrieval without exiting the vehicle. The holder is manufactured of high- strength extruded aluminum with a textured black powder-coat for additional corrosion protection. Large thumbscrews secure the jack. 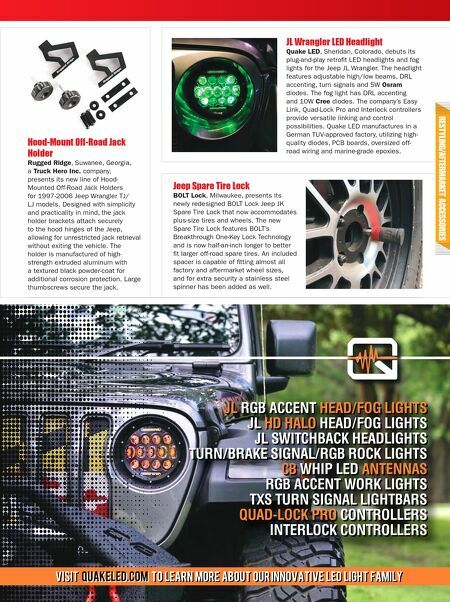 JL Wrangler LED Headlight Quake LED, Sheridan, Colorado, debuts its plug-and-play retrofit LED headlights and fog lights for the Jeep JL Wrangler. The headlight features adjustable high/low beams, DRL accenting, turn signals and 5W Osram diodes. The fog light has DRL accenting and 10W Cree diodes. The company's Easy Link, Quad-Lock Pro and Interlock controllers provide versatile linking and control possibilities. 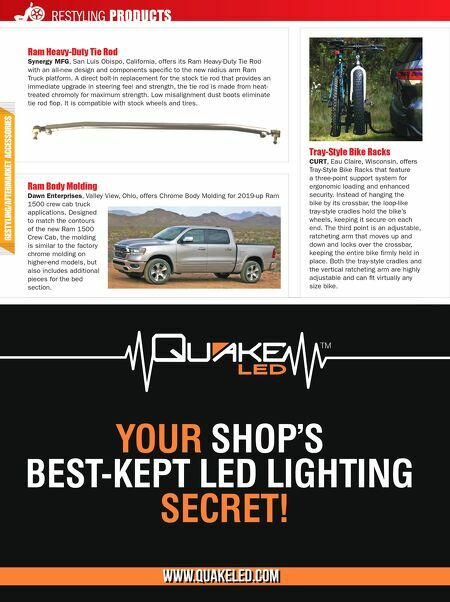 Quake LED manufactures in a German TUV-approved factory, utilizing high- quality diodes, PCB boards, oversized off- road wiring and marine-grade epoxies. Jeep Spare Tire Lock BOLT Lock, Milwaukee, presents its newly redesigned BOLT Lock Jeep JK Spare Tire Lock that now accommodates plus-size tires and wheels. The new Spare Tire Lock features BOLT's Breakthrough One-Key Lock Technology and is now half-an-inch longer to better fit larger off-road spare tires. An included spacer is capable of fitting almost all factory and aftermarket wheel sizes, and for extra security a stainless steel spinner has been added as well.